"Today Japan only exports about 4% of its precious matcha. By partnering with Shohokuen, one of the oldest and most established Matcha suppliers in Japan, we are able to bring DōMatcha to you directly from Kyoto, the place where Matcha originated. DōMatcha contains only the youngest and finest, shade-grown, top 2 leaves and unopened buds of the tea plant. The leaves are de-stemmed and de-veined and finally stone-ground to a very fine, talc-like powder of vibrant green. The simple fact that you consume the entire tea-leaves makes Matcha one of the healthiest beverages on earth, providing you with approximately 10 times more of the health-promoting nutrients of steeped green tea. The Matcha powder is so fine that it is absorbed instantly and completely so your body will get the full health benefits quickly. This potent powdered green tea is charged with antioxidants and chlorophyll. It is a powerful detoxifier and an extremely healthy energizer that will change your journey through life! 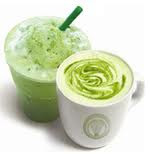 Most people in North America drink matcha either in a latte form or traditionally with hot water as a tea. If drinking it when mixed as in a latte or blender drink, try using the 2nd Harvest matcha – more astringent flavor, approx 0.50 cents a serving. If one is going to drink the matcha traditionally then try our Ceremonial grade matcha – smoother tasting, about $1.10 a serving. People also make green tea ice cream, matcha cookies, cakes, salad dressings, alcoholic beverages with matcha." ***NOTE from DoMatcha***"DoMatcha has a Relieve Assistance program in which we'll be donating 10% of all online sales to the Japan earthquake relief, which will be matched by our parent company EcoTrend!" What we thought: This tea was unlike any other I've tried. The powder is super fine and it mixes up into a frothy, rich tea even without milk or cream! It makes a wonderfully tasty latte and a decadent frappe just in time for the the warmer weather:) This tea really tastes like a luxurious treat, almost like a dessert! If you are a fan of tea, I definitely suggest trying DoMatcha at least once...you might just decide its your new favorite indulgence:) ABCD Diaries gives DoMatcha an A! Buy It: Find these spectacular teas at DoMatcha! Disclosure: ABCD Diaries was given tea samples for review purposes only. We were in no other way compensated. The opinions expressed in this post are ours and ours alone.